Can solar technology generate clean water for developing nations? Rendering of the Watly 3.0 (image courtesy of Watly). No matter how dirty the liquid, the solar-powered computer will produce clean water, says Watly (image courtesy of Watly). 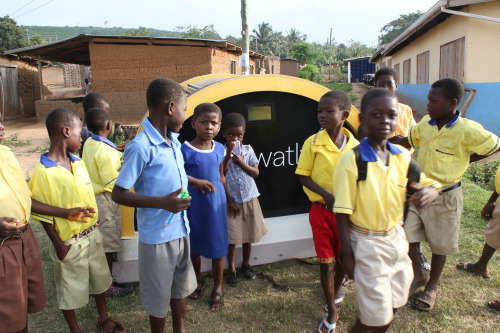 Children in Ghana enjoyed the benefits of the technology during the project’s trial (image courtesy of Watly). Watly aims to change the way in which technology is providing for the poorest people across the globe. 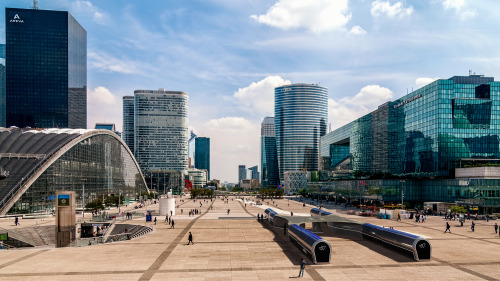 Its mission is to improve global living standards for the most in-need people in the world by providing water, energy and connectivity in a green, sustainable system. The company believes the Watly model combines clean technologies in an innovative way in order to provide these three ‘pillars’ of modern civilization in one solution. The latest, and most advanced of the company’s machines is the Watly 3.0. Standing at 2.4 metres off the ground, the 40 metre-long machine is capable of sanitising 5,000 litres of water per day, enough to provide for a community of 3,000 people. The solar-powered thermodynamic computer is also a powerful communication device that can download and upload data to and from the Internet. All of these functions are powered by the solar park made up of 40 panels on Watly’s roof. A single unit will last for 15 years, according to the company, and, because it is emission-free, could save as much as 1,000 tonnes of greenhouse gas emissions (CO2), equivalent to 2,500 barrels of oil, while purifying millions of litres of water and generating 1GWh (1,000 megawatt hours) of free electricity. Primarily the machine is a large computer, dealing with all the functions that define it as such, such as calculating, broadcasting and collecting information, while sending data to the cloud. However, the machine also incorporates photovoltaic solar technologies to generate electricity off grid. This energy is used to empower the electronics inside the machine itself, as well as for recharging external devices such as portable phones, tablets and laptops. In addition, a Watly machine uses thermal solar technology to sanitise water, removing chemical, bacteriological, or physical contamination. The technologies combine to create what Watly claims to be a self-sufficient and efficient system. The dirty water which is fed into Watly flows underneath the solar panels which cover its roof. This water helps to cool the solar panels down, keeping them at an optimum temperature of 25oC. At this temperature, the solar panels, which do not respond well to excessive heat, become between 40-50 per cent more efficient. Simultaneously, the machine uses a patented system to transfer heat to the dirty water, warming it up towards boiling point and thereby contributing towards the sanitation process. Watly purifies water from any form of contamination using a technique called vapour compression distillation. This technology involves heating water to temperatures of around 115oC, at which level different forms of contamination are separated from the clean water, which is distilled. Once distilled, the purified water flows in a special mineralizer and acid reducer, which regulates water pH and minerals, optimizing the water for drinking. The technology does not use filters or membranes as some other forms of sanitation do, thus eliminating the need for substitution of filters, or for chemicals such as membrane cleaners, scale inhibitors and antiscalants. 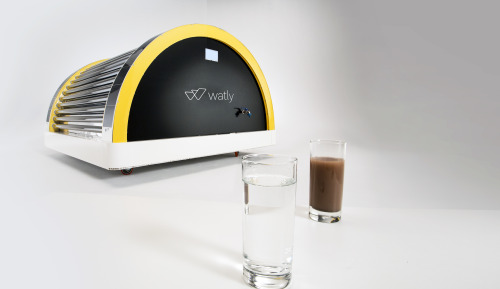 In addition to the vapour compression system, Watly also uses a graphene-based technology to separate water from soaps, solvents and hydrocarbons. The 4,000 litre tank applies graphene in a unique way, and is currently under patentability evaluation. A key advantage compared to some other purification and desalination methods may be that Watly’s water output does not depend on the type of water input. Any kind of polluted water – from oceans, lakes, rivers, ponds, or even sewage water – can be fed into Watly, and according to the company, no matter how polluted the water going in, the result is always the same: clean water. The water is delivered to end users through three interactive stations, where a water filling system automatically fills-up specially designed water carriers in 25 seconds. This innovative combination of technologies is proven to be effective, having been trialed in a smaller, but otherwise identical, version of Watly on location last year. The trial saw the team take the Watly 2.0 to Abenta village in Ghana, where residents were able to drink clean water from the machine, recharge their phones and other devices, and benefit from the connectivity provided by Watly. The machine had been tested for almost 2 years prior to this so the trial was not designed to test the viability of the technology. By this point, the technology had received a number of accreditations and accolades, but trial tested the human acceptance and social impact of the technology, helping to show that it would be welcomed and well received by the communities it aims to transform. Watly’s innovative design is based on the concept of the ‘Energynet’. The idea of the Energynet grasps the transformational potential of combining vital and basic resources into a self-supporting ecosystem. It also refers to a solar-powered smart-grid which can behave like the Internet but also allow information technology to be fused together with the necessary provision of electricity and water. And contrary to the Internet, the Energynet generates the very same power it needs to function. The sustainable Energynet system, of which Watly can be counted as a prime example, aims to bring the IoT to places where there is no Internet and where there are very few things, thus providing the resources for survival and advancement to some of the most resource-poor places in the world. Marco Attisani is founder and CEO of Watly.